I painted Durga in 1996 for The Goddess Oracle. All goddesses in Hindu belief are ultimately the same goddess, often called simply "the Goddess" or "Devi." But she appears in different forms with different names. One of the fiercest of Devi's forms is Durga. She was also the eldest: during the primordial war between gods and antigods, Durga was the first manifestation of goddess-energy. The war was a standoff; neither side was winning, and the battles dragged on without victory. Almost hopeless, the gods gathered and concentrated their energies. Flames sprang from their mouths and formed Durga, the first female divinity in the universe. Although produced by the gods, the goddess was stronger than any of them, or all of them together, and she was fiercely eager to fight. Recognizing her power, the gods handed their weapons to Durga. She mounted a lion to ride toward the antigods' chief, the demon Mahisa. That magical being, terrified of this new apparition, used his powers to assume one fearsome form after another. Still the goddess advanced, until finally, as the demon assumed the form of a buffalo, Durga slaughtered him. The demon nonetheless tried to escape through the dying beast's mouth, but Durga caught him by the hair and butchered him, thereby freeing the earth for the gods to inhabit. 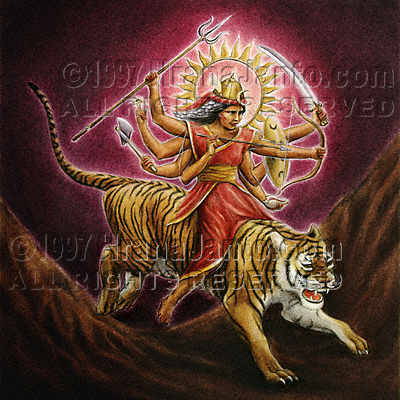 The goddess in this form not only symbolizes the fierce power of the combat against evil but also the rule of the intellectual sphere, for Durga ("unapproachable") represents the end of all things; to seek to understand her is to engage in the most powerful intellectual exploration possible.